veggie num nums: David Eyre's Pancake. Genius. I have a feeling I will be making these every weekend morning for the rest of my days since Dave is absolutely mad about them. I don't even think I'll mind all that much since the batter takes about 2 mninutes to mix up. So simple--mix the batter and pop the pan in the oven. Supposedly, this is one of the most popular recipes ever published in the New York Times. You can read the whole article and get the recipe here. These taste sort of like a puffed crepe and sort of like a popover--very light and airy but with crispy edges. I think they are best with lemon and powdered sugar, but Dave likes topping them with maple syrup. 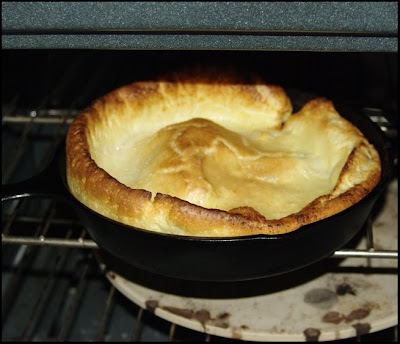 I think that this recipe is a version of a "Dutch Baby", my Grandma D.'s favorite breakfast. This batter is full of nutmeg which gives the pancake a lovely bit of spice. The bottom line is that David Eyre's Pancakes = a super simple wow breakfast. Michele, that looks beautiful! I've got to try this. The recipe I've tried before is called an apple dutch baby. It's good, but apples aren't so good this time of year, so I'll try this version instead. Wow, that is genius. I am definitely going to try this recipe next weekend. Thanks for sharing it, Michele. Just tried it. very tasty, like breadless french toast. We spread maple butter on top! 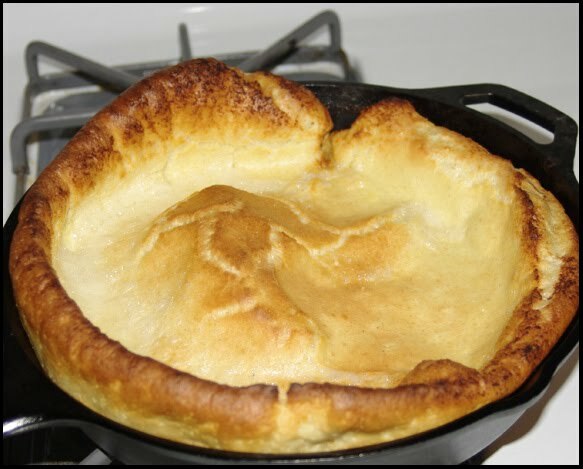 It does look like a Dutch Baby. "Little Della" as Marisa is sometimes called, loves Dutch Babies too!. She makes them pretty much herself except putting in/taking out of the oven. Cheryl--How cute that Marisa is also known as Little Della! !